Perhaps the most important part of today’s OttawaWatch appears in the latter part of the column. I would encourage readers – even more than usual – to read all the way through. The “robobcalls” subject has been of considerable interest around the Press Gallery in recent months. It has mostly related to queries regarding whether calls allegedly made during the 2011 federal election campaign by one “Pierre Poutine” were placed on behalf of one particular party. Last week, the robobcalls question took a slightly different twist. 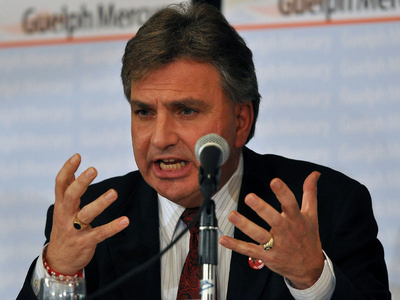 The 2011 campaign organization of Guelph Liberal MP Frank Valeriote (rhymes with “chariot”) was fined $4,900. The offence: Improperly failing to identify a robobcall to several thousand Guelph constituents as being from the Guelph Liberal campaign. In fact, a fictitious name had been used to identify the caller. When complaints were registered with Elections Canada, earlier this year, Valeriote readily admitted that the calls had been made. And he suggested that some of the fine Elections Canada compliance details had been forgotten in the heat of the moment. As the Guelph MP put it, that calls had been organized in a hurry, after information coming from local prolife-sponsored polls had indicated that he took a “pro-abortion” stance. He self-describes as a “pro-choicer” who is personally opposed to abortion. According to Valeriote, some of the poll information was being disseminated by Marty Burke’s campaign. Burke was the Conservative candidate. … Valeriote has confirmed his campaign used an auto-dialed phone message to tell voters in the riding that the Conservative candidate, Marty Burke, opposed abortion. Valeriote said the call was recorded by a volunteer from his campaign who used a fake name because she feared retribution from anti-abortion activists. The recording, provided by a Conservative supporter, features a woman who identifies herself as Laurie MacDonald, but doesn’t say she’s calling from Valeriote’s campaign. For purposes of making a point, I have chosen to use bold face type to emphasize certain parts of the CBC story. This writer would like to gently suggest that the phrase in the Valeriote campaign call which includes “extreme” is a form of a different kind of attempt at voter suppression – one with psychological roots. Now in putting forward this idea, I realize that language in the heat of an election campaign frequently takes on extremist and oppressive connotations. And those techniques are bent to the purpose of suppressing a vote for the candidate of another party. In this case, it would seem that the attempt at suppression was framed so as to pit moderate social conservatives against those who might be opposed to abortion under all circumstances and, as well, to contraception. Having noted all the above, I would like to present another side of Frank Valeriote – one which, from this particular corner, is much more attractive. At the time the report was produced, I described it as a pro-life document, dealing mostly with end-of-life issues. Further, the founders, working together in a non-partisan fashion, drew heavily on each of their own respective basically-Christian faith stances. It was an instance of the kind of parliamentary work we need to see more often. During the panel discussion, Valeriote made the point that he belongs to two churches – one Catholic and the other evangelical. The evangelical congregation, as it happens, is Lakeside Bible Church of Guelph, a 1500-strong progressive Plymouth Brethren group. Now I don`t know if it is really any more possible to belong to two churches as to two political parties. But the sentiment is good. And I like the side of Valeriote exhibited in his church affiliations and Compassionate Care committee work much more that that which permitted his campaign committee to lash out as it did in the 2011 election. But it is not all his fault. The present, adversarial system, together with the too-frequent “class warfare” mindset present in that system militates toward very hurtful public rhetoric. I don’t know the answer, in terms of the necessary democratic or parliamentary reform. But I do believe that if constructive action could follow principles of co-operation, collaboration, conciliation – and whatever other positive c-words are available – we could embark on some kind of new pace-setting era in both domestic and international politics. Valeriote would not need to lash out because, in a conciliatory world, the stakes would be much different. There would be no need for what appears, in this situation, to be a prima facie case of psychological voter suppression. Meanwhile, I will get back to studying to see if I can eventually come up with some suggestions to make these lofty principles possible. But, dear readers, please don`t leave it all up to me.